Parts 1 and 2 of this article, (2017) 37 Qld Lawyer 26 and (2017) 37 Qld Lawyer 80, have considered the uniquely statutory nature of the public road in Queensland through issues relating to its creation, ownership, and control, and private rights exercisable in respect of the road. So far, the article has, in considering those issues, highlighted a concern that the further we move away from the abstract common law idea of a highway, there is a risk that a road simply is an area of land for road purposes, those purposes being determined in large part by statutory road authority decision-makers. In the end, it may become difficult to know what a road really is anymore. This Part 3, the final part of the article, looks at the nature of the public’s use of a road, the concept of the “road in fact”, and the closure of roads. It concludes by suggesting that Queensland may benefit from a single and well-crafted Roads Act. The advancement of technology into our lives continues at pace. How the law accommodates technological advances and in what areas of the law is often dependent upon the cases required to be considered by the courts. In the case of Re Nichol  QSC 220 the Supreme Court was required to consider the validity of an unsent text (SMS) as a testamentary disposition. The court determined that on the particular facts and circumstances of the case that the unsent text met the statutory requirements of a testamentary disposition. 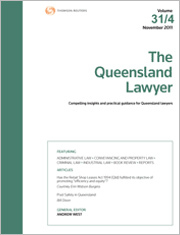 For the PDF version of the table of contents, click here: Qld Lawyer Vol 37 No 3 Contents.